Las Vegas may be Kyle Busch's home town but today it really was Sam's town. Sam Hornish Jr. earned his second career Nationwide win, leading 114 of 300 laps, holding off Busch on two restarts inside the final 50 laps of the race. "I didn't even realize it was the Sam's Town 300 until I went to the driver's meeting this morning," Hornish said. "I said that would be a good one for me to win. Already got my name on the trophy." 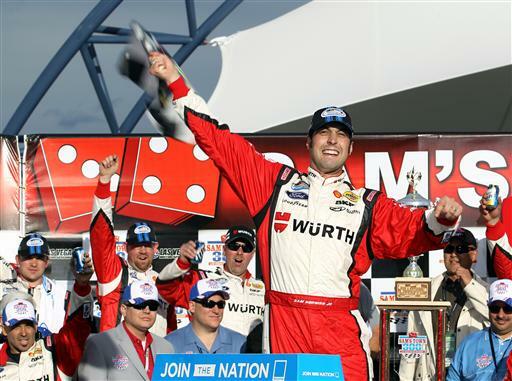 Seeing Hornish wearing red, white and black in victory lane was a common sight during his IndyCar days. In his 19 wins with Team Penske, Hornish has trophies from SCI sister tracks at Texas and California, but this was his first at Las Vegas. The victory was an emotional one for Hornish, coming at the track where his former Panther Racing teammate, Dan Wheldon, was killed. Hornish's first Nationwide win came just a month after that tragedy, and he said he didn't feel he could celebrate that win under the circumstances. Although he got choked up a few times, Hornish certainly didn't have a problem reveling in this win, which keeps him atop the points standings. With only three Sprint Cup regulars in the field, the depth of talent in the Nationwide Series really stood out. Only Busch, Dale Earnhardt Jr. and Brad Keselowski entered the race, with Busch finishing second, Earnhardt Jr. 14th, and the reigning Cup champion 37th. Third place went to Brian Vickers, Trevor Bayne was fourth, and Elliott Sadler rounded out the top five. Vickers led 27 laps, Bayne 21, but in the end it was all the No. 12 of Hornish Jr.
Austin Dillon wound up sixth with Regan Smith in seventh. Alex Bowman was the top-finishing rookie with his eighth place run. Bowman's reportedly owes his smooth performance to the advice of Mark Martin, who knows a thing or two about winning in Vegas. Brian Scott held on for ninth. Travis Pastrana put in a solid performance running just outside the top ten most of the day but managing to push his way into tenth position right at the end. Pastrana gave good feedback to his crew chief during the race and seems to be settling into place at Roush Fenway Racing. Next week's visit to Bristol should prove interesting for the extreme sports standout since it will be his first short-track race in a Mustang. With 19 lead changes among nine drivers, the race featured some good action despite the track being washed clean in the rain NASCAR seems to bring with it where ever it goes, even the desert. Rookie Kyle Larson had yet another scary moment when Joey Gase got pushed into him, forcing the No. 32 into the outside wall and then down to the apron in flames. Larson escaped unscathed to finish 32nd.